Of course when asked, “what is the most important part of your wedding celebration?” The wedding ceremony wins. However, your reception is the runner-up. Your reception is the area that allows your guests to see more of your unique personality and style as a couple. Below is a list of reception styles to help you figure out what is best for your special day. 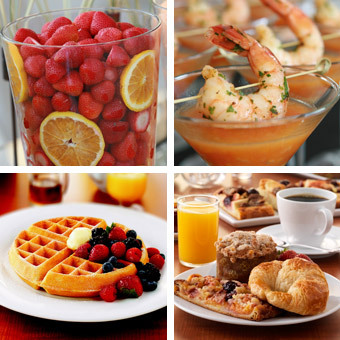 For the couple that would like to have a morning wedding , a breakfast brunch would be an ideal choice. This style of reception is a very intimate and inexpensive option. You can lavish your guest in various types of omelets, waffles, marmalades and specialty sausages. Because of the time of day, dancing is most likely not happening with this type of reception. However, you and your sweetie will be able to leave for your honeymoon earlier. Benefit: Inexpensive menu and you can leave for your honeymoon the same day. Consider: Some of your guest are not early risers and not able to make it to your wedding. With a luncheon reception, you are able to offer a menu of items you would have at a dinner reception for a cheaper price. Also this reception style is shorter than the evening receptions with little to no dancing depending on your venue choice. Still this option is an awesome reception with great menu choices. Benefit: luncheon is still less expensive than dinner and you are able to serve some of your dinner favorites for a cheaper price. Consider: Not too many guests will want to dance at a lunchtime event. For our hopeless romantics this option is perfect! Create an old fashion English tea time with this delightful and affordable reception. A traditional tea time is a mix of sweet and savory. 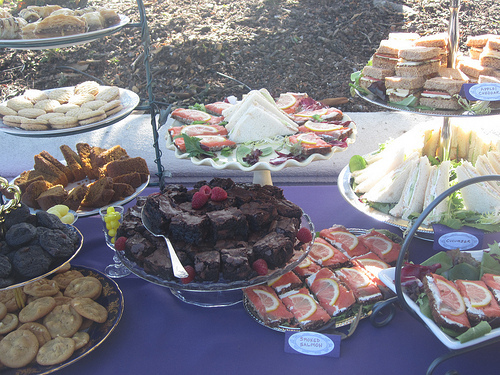 Provide your guests with menu options of tea sandwiches filled with chicken salad or salmon paste with various scones, jams, fresh fruit, traditional teas and don’t forget the wedding cake! Benefit: An afternoon tea event is a great opportunity for creativity. This style of event also works well for couples with a large guest list and a small budget. Consider: This type of wedding reception does not offer a full meal for wedding guests. This reception style was the tradition after a wedding ceremony. No asking your guest to travel to a different site. Simply enjoy luxury desserts and champagne toasting. This style of receptions is a very elegant upscale option with a significant savings on your pockets. Have prepared various dessert options with champagne, tea, and coffee option for your guest. Benefit: This option is sophisticated and inexpensive. The couple who is looking for a more casual reception with menu options for their guest should consider a buffet option. A buffet reception save you money because you don’t need to pay for a wait staff. You also have a larger choice of food options to accommodate the diets and taste buds of your guests. Benefit: Offers a variety of options for your guest and encourages them to get out of their seats and mingle. Consider: Guest tend to spend a lot of time in line for food and not an elegant option. Also you may run out of food or have too much left over. If the budget can afford to have table service for your guests a sit-down dinner is an elegant and traditional option. Those who select this option do so because of the ambiance formal service offers. This style usually offers one to three entrée options with an appetizer, salad or soup with side dishes and dessert. Benefit: Makes it easy for the couple to calculate the amount of food needed and provides portion control. Because everyone eats at the same time, it allows for people to finish their meals quickly and enjoy more time on the dance floor partying. Consider: The cost of this reception is not cheap and collecting your guest RSVP and meal choice is stressful when they don’t respond timely. This is the latest trend for couples. Food stations offer more food options for your guest. Food stations also allow you be able to serve samples of traditional foods in a creative way. 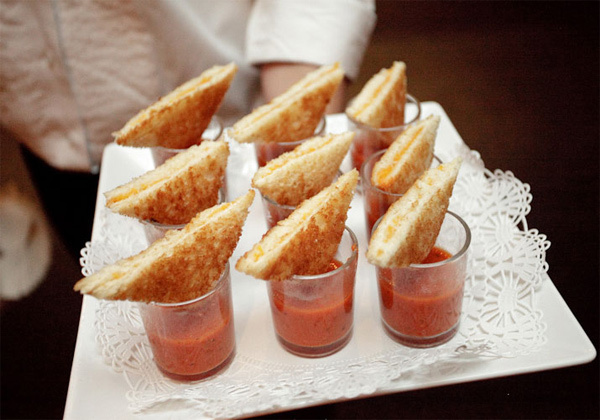 For example, a triangle grilled cheese with a shot of tomato soup. You can also go from appetizer, to an entrée item, to desserts very easily. Benefit: Food stations are a foodies dream. They give a lot of creativity and fun options for your wedding guest. This allows you to have full creative and unique control of a wedding theme. Consider: While you are not serving a meal, it can still be expensive to make sure you have enough food for the timing of your reception. You also have to ensure the stations are far enough apart for crowd control. If you have any questions, please don’t hesitate to email me and I’ll be glad to answer any questions you may have. Most little girls start planning their wedding years before there is even a groom. Now your engaged and excited to fulfill your wedding dreams. However, the price tag is steeper than you expected? Don’t start panicking. You can still have your fabulous wedding by using some of these following tips. Wedding season is usually when the prices of various vendors are at the highest prices. When planning your wedding, the first order of business is to select your venue and date. Saturday evening weddings are 15% more expensive than other days of the week. Consider having an early day wedding or brunch wedding. This will save you money in more than one way. Most people drink less during the day and most caterers do not have an appetizer menu for brunch hours. Which allows extra savings on food and beverage. If your preference is to drink and party all night, look at having your wedding on a Friday night. You can have your dream reception at a discounted rate. Also, the rates for wedding venues and vendors are higher during wedding season: May-October. Consider having your wedding during off-season months: November-April. Keep in mind that the weather is cooler during the off season time depending on your region. Plan wisely!! Of course you want everyone you know and love to celebrate your union. However, with the cost of catering everyone becomes the select few. To keep the price down, do not allow your single friends to bring a date. Just think cutting 10 extra people with an estimate cost of $100 per plate your saving an extra $1000. That sounds like honeymoon money to me! To economize on your dress consider all the fabrics that dress makers use. For example, selecting a dress that has a lower end satin can cut the price by almost two-thirds. Also considering the right season for dress shopping. Shopping in the late spring/early winter will allow for you to take advantage of the bridal gown season. If you really wanted to stretch your budget, choose a bridesmaids gown and order it in white and VOILA! You have a wedding gown. cake is decorated just like your dream cake. However, there is only one real layer of cake so when you are doing the cake cutting ceremony you are cutting into a real cake. After your pictures, your caterer moves the cake to the back where there is a sheet-cake that they will cut up and serve to your guest. Renting a cake can cost as little as $150. That is at least a 50% savings. Of Course there is no way I could round out this suggestion list without stressing how important it is to hire a professional consultant. Hiring a consultant can not only save you time but you will be able to save money by using your consultant’s network of vendors. Usually consultants have exclusive deals they work out with various vendors. The only way for you to take advantage of the deals is to hire a planner. Using all or some of the above is a sure way to maximize your budget and create the wedding of your dreams! You are excited and looking to plan a spectacular event. A major component to your event is deciding who to invite. While on the surface this may seem like an easy task, once you start to consider your venue, menu, decor and overall budget, you may notice that you may not be able to afford to invite everyone. So unfortunately, you look to make some cuts in the number of attendees at your special occasion. So, how do you decide who makes the cut and who doesn’t? I have a strategy to approach this task with confidence. The goal of creating your guest list is to have family and friends who will serve as witnesses to your union and celebrations. Realize this strategy can be used for birthday parties, baby showers, or any kind of event where you need to monitor your guest list. To start your guest list you MUST KNOW THY BUDGET. Your budget is everything. You have to know what you can afford to make an informed educated decision. Without knowing your budget you can set yourself up for a disaster, and that is NOT the way to start a marriage. You can expect to spend 48-50% of your budget on your reception. Knowing how much you are working with, will allow you to know how much you can spend per person. Once you have that number you can begin creating you guest list. 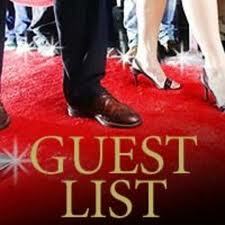 Your guest list is going to go through a few revamps before you get to the master guest list. Below are the steps to take to get to your final master guest list. Step 1: Generate a List – Compile a list of people, who you want to invite. Have your husband to be, your parents, and your fiancé’s parents also compile a list of people they want to invite. Step 2: Prioritize your List – Divide your list into three (3) categories, Must Invite, Should Invite, and Could Invite. Go through your list and label each person according to the categories. Must Invite are for family and friends that you could not even imagine not being present for your special day. Should invites are for friends that fall in if you didn’t meet your cap with your must invites and could invite fall in after the should invites. Step 3: Once you have organized your list. compile it with your fiancé’s list. and parent’s list if applicable with the appropriate categories. Must Invites will get an invitation, If there is room after the must invites move into Should and then the Could. You then have your Master Guest List!!! You do not have to invite people you work with, Who knows how long you will continue to work with them.